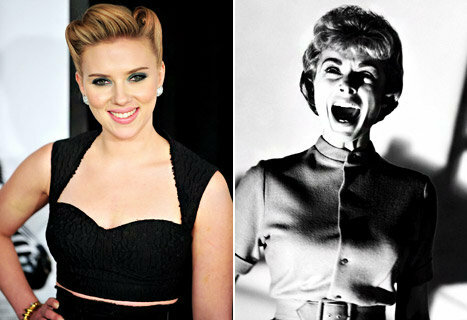 Home / CELEBRITY NEWS / Scarlett Johansson is Janet Leigh! Scarlett Johansson is Janet Leigh! Sultry and controversial actress, known for #scarlettjohanssoning, Scarlett Johansson is set to play the role of the iconic Hollywood actress, Janet Leigh, the actress who played several famous movies including Little Women (1949) and starred in one of Alfred Hitchcock's classic horror movies, Psycho (1960). The 27 year-old actress has signed to play the role in the movie entitled, Alfred Hitchcock and the Making of Psycho. Janet Leigh is the actress who portrayed Marion Crane, the woman who is murdered while taking a shower at the Bates Motel in the movie Psycho. The upcoming movie is based on the nonfiction book of the same title, written by Stephen Rebello. The Alfred Hitchcock and the Making of Psycho movie will also star Anthony Hopkins as the auteur Alfred Hitchcock, Helen Mirren as Alma Reville as Hitchcock's wife, and British actor James D'Arcy as Anthony Perkins, the actor who portrayed as the serial killer Norman Bates. The movie is said to focus on the life of Alfred Hitchcock while filming the horror movie Psycho during the height of his career. The screenplay will be written by John J. McLaughin, the screenwriter who wrote Natalie Portman's psychological thriller movie Black Swan. The movie will be directed by Sacha Gervasi. Now this is something to look forward. Release date of this movie is yet to be announced. Market! Market! relaunches its cinemas for better viewing pleasures!